Immunogen: Bovine skeletal muscle Actin. Formulation: Liquid. In PBS, pH 7.2, containing 0.09% sodium azide and 50% glycerol. Scientific Background: Actin is one of the major proteins (~42 kDa) of the cytoskeleton. It regulates contractile potential in muscle tissues and helps to control the shape as well as the motility of non-muscle cells. 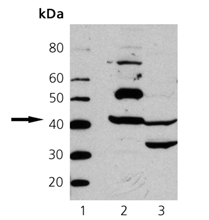 Actin is expressed in all eukaryotic cells which makes it a useful loading control in Western blotting experiments. In higher eukaryotes, there are six isoforms of actin: Three alpha-actins (α-skeletal, α-cardiac, α-smooth muscle), one β-actin (β-non-muscle) and two γ-actins (γ-smooth muscle and γ-non-muscle). Actin isoforms show >90% overall sequence homology.